The script looks very promising, though there is one caveat about the file size claim: the minified version is 5kb when served with gzip compression. If, for whatever reason, your server is not configured to do so, then it’s more to the order of 15kb. Still small, but not quite as amazingly so. 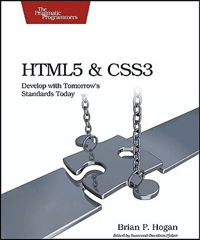 I recently unearthed a review copy of a book that somehow got lost in the shuffle a couple of years ago, HTML5 and CSS3: Develop with Tomorrow’s Standards Today by Brian P. Hogan, which is too bad, since it’s one of the better books I’ve seen on the subject. It’s a comprehensive primer on the changes in HTML5 and CSS3. I enjoyed reading through the book after I unburied it last week. It features a chapter on logically marking up page structure with the new semantic tags (header, nav, section, article, etc. ), which explains the contexts they should be used in with a hands-on example of restructuring a blog without excessive divs. A lot of online tutorials make the error of suggesting the aside element for a blog sidebar, which the book helpfully points out as wrong. The section element is the proper tag for the job, as it denotes an arbitrary section of the page, whereas aside is for broken-out sections of your article content, such as pullquotes or diagrams. Ever since the days of print, it has been common to style quotations and cover blurbs with oversized quotation marks floating along the left side. The practice is alive and well in the internet age, though the technique usually used is a background image. It’s 2012, already! Why are we still relying on pictures of typographical symbols? Let’s do it with the power of CSS! Let’s start with some simple HTML. Before we can style anything, we need to create our blockquote. While we’re at it, a cite element is a nice, semantic way to attribute the quote to its originator. Have you ever looked at the HTML snippet for Twitter’s Tweet button and wondered what those data-something="loremipsum" attributes were? I did too, and after a bit of Google searching, I found a post by John Resig (the creator of jQuery) that explains that they’re something called data attributes. Firebug is probably the most invaluable tool in my web development arsenal. (Well, aside from Photoshop. But that has a value: freaking expensive.) I’m not terribly picky about my text editor—after all, I used Notepad for years—though BBEdit is my tool of choice. I still haven’t found anything that works nearly as well as Firebug, and that’s probably the biggest reason why I couldn’t give up Firefox for Chrome. Everyone who uses Firebug regularly knows the basics. They know how to inspect and edit HTML and CSS, analyze page loading times and the like. There are a few neat tricks, though, that aren’t quite immediately apparent, but are very handy.